Place a wooden or rubber block between the jack and arm. Remove the 2 bolts and disconnect the shock absorber with the bracket. 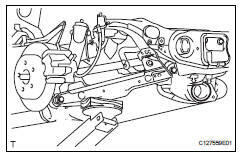 Remove the nut and bolt from the shock absorber upper side. Remove the nut and bolt from the bracket. 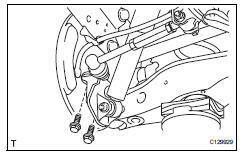 While fixing the nut in place, loosen and remove the bolt. Compress and extend the shock absorber rod, and check that there is no abnormal resistance or unusual sound during operation. 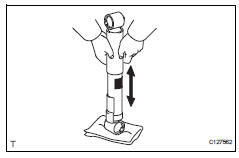 When disposing of the shock absorber, see disposal (see page sp-37). Temporarily install the bracket to the shock absorber with the bolt and nut. Fix the nut in place and temporarily install the bolt. Temporarily install the shock absorber upper side to the suspension member with the bolt and nut. 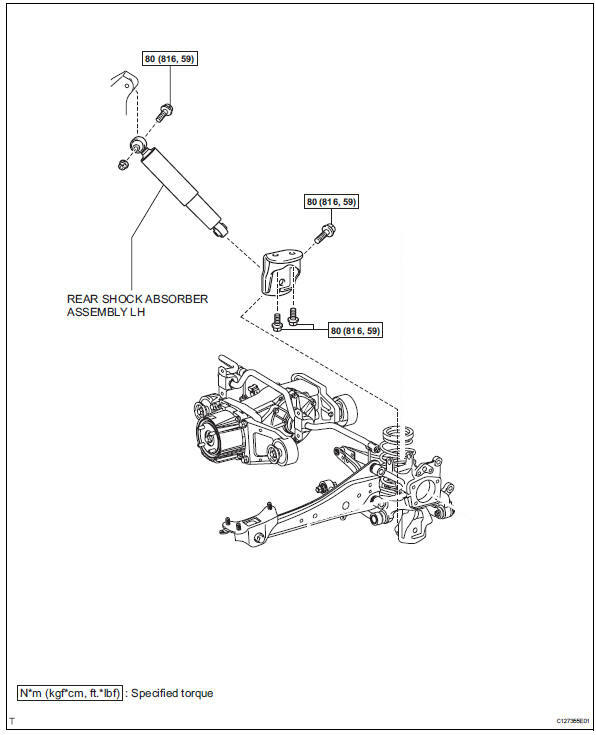 Install the shock absorber with the 2 bolts to the axle carrier. 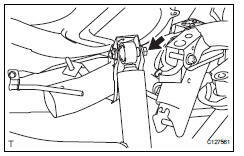 Press down on the vehicle several times to stabilize the suspension. Fix the nut in place and tighten the bolt. Fully extend the shock absorber rod, and clamp it in a vise at an angle. Using a drill, make a hole near the center of the cylinder in the hatched area shown in the illustration to discharge the gas inside. Cover the area being cut.